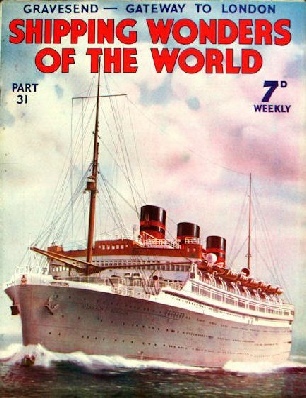 Part 31 of Shipping Wonders of the World was published on Tuesday 8th September 1936. This issue included a colour plate illustrating the Monarch of Bermuda, which formed part of the article on the Bermudian Luxury Liners. The plate was attached to page 973 of part 31. “This week’s cover shows the Monarch of Bermuda, described, with her sister ship, the Queen of Bermuda, in a chapter by A C Hardy in this week’s Part. 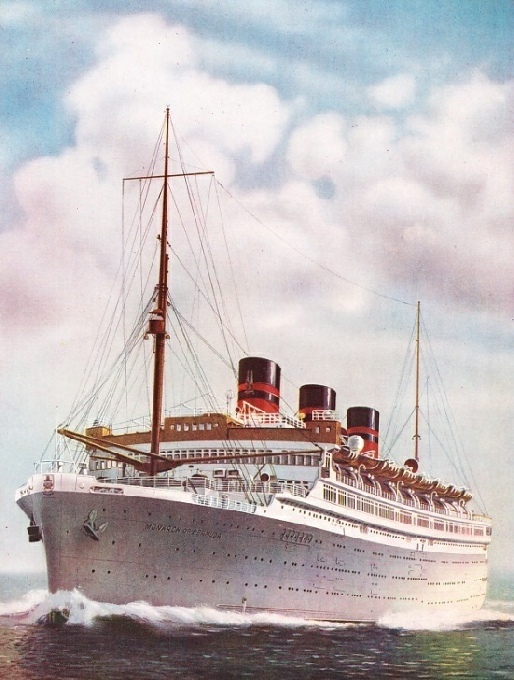 The original photograph, from which this cover was made, I obtained through the courtesy of Vickers-Armstrongs, the builders of the great luxury liners.” The cover was also reproduced as the colour plate in this issue. In the long history of the sea, there have, of course, been some failures as well as many glorious successes, some tales of disaster besides those stories of ships with which all has gone well. But even in the tragedies there is something inspiring. The extraordinary sinking of HMS Victoria in 1893 in the Mediterranean and the loss of the troopship Birkenhead off Danger Point, near Simon’s Bay, South Africa, on February 26, 1852, will long be remembered for the heroism that these catastrophes called forth. The Victoria was Britain’s finest battleship when in 1893 she came into collision with the Camperdown during manoeuvres in the Mediterranean. She sank with twenty-two officers and 336 men. The tale of tragedy, however, was mitigated by the extraordinary courage and discipline of all concerned. In the same way the men of the Birkenhead displayed magnificent calmness and fortitude when their ship went down near Capetown. The story is one of the epics of the sea. 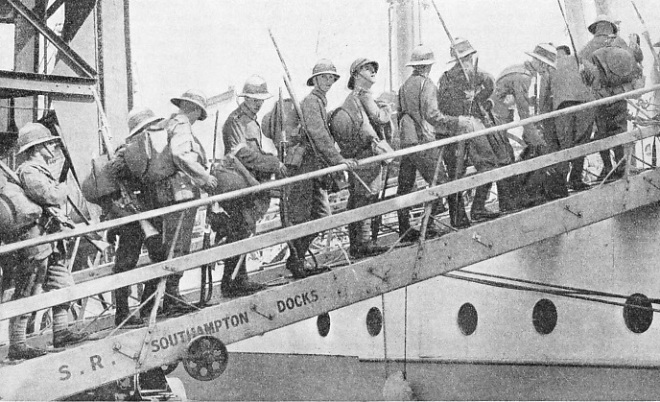 All the women and children on board the transport were rescued; the soldiers intended as drafts for the forces in South Africa awaited the end as if on parade. The article is by Vice-Admiral Gordon Campbell. The Kurenai Maru, the vessel illustrated above, was one of the first ships built for the Japanese Inland Sea to be fitted with diesel engines. Completed in July 1924, she is owned by the Osaka Shosen Kaisha Company, whose big cargo liners are familiar on the trade routes of the world. She is a ship with three decks. The upper deck is the main deck, with a forecastle gallery and pantry round the casing, as the drawing shows, and open sleeping spaces for men at the after end. Below this is a ‘tween deck with further open sleeping spaces, and above the upper deck is a promenade, with a fine observation dining-room at the forward end and more open space at the after end. Here are two- and four-berths cabins and some further open spaces, as well as a smoking-room. The Kurenai Maru was built at the Osaka Ironworks and has a gross tonnage of 1,541. She has a length of 238 ft 3 in, a beam of 38 feet and a draught of 19 ft 7 in. Her speed in service is just over 14 knots. 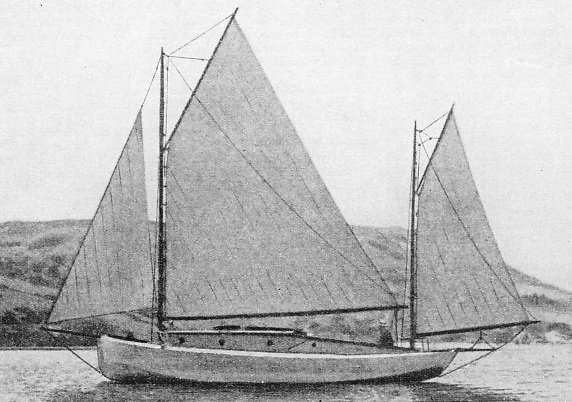 Her diesel engines were built in Copenhagen by Burmeister and Wain. The two engines are of the four-cycle single-acting type. Either has six cylinders with a diameter of 19.68 in and 35.43 in stroke. The total power developed is 1,600 bhp at 140 revolutions a minute. Electricity is used for auxiliary purposes and the total output on three generators is 150 hp. This is the twenty-third article in the series on Merchant Ship Types. The regulations and rules, international, national and local, which govern yacht racing have undergone considerable changes in the last thirty years. Many conditions make yacht races difficult for the layman to follow. One reason for this is the system of handicapping, which often makes it difficult for those not conversant with the rules to tell which boat has won. This intricate subject is elucidated in this chapter which is written by Frank Bowen. 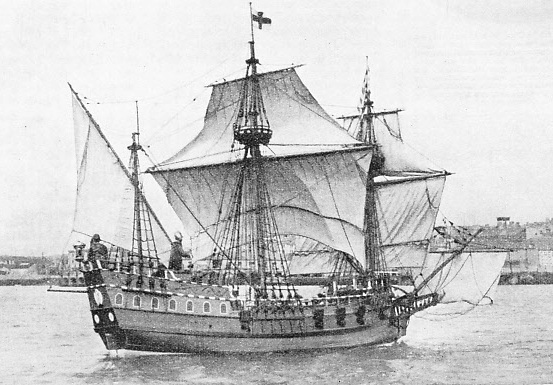 The story of Francis Drake and the Golden Hind, concluded from part 30. FOUR LARGE RACING YACHTS whose names are familiar to the general public. The Candida is followed by Shamrock V, the late Sir Thomas Lipton’s famous America’s Cup contestant, and by the Astra. The black-hulled yacht at the rear is King George V’s Britannia, which was scuttled by the Admiralty in the English Channel in July 1936. 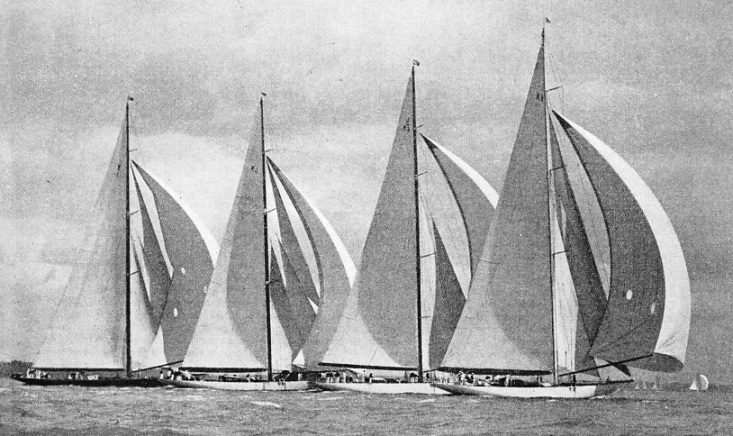 These yachts are racing in the old “over 21-metres” class, now replaced by the J class. Situated on the Kentish shore of the River Thames opposite Tilbury, Gravesend is one of the main bases of river and Channel pilots, of Customs and immigration officers and of the Port of London Sanitary Authority. From time immemorial, Gravesend has been regarded as the gateway to London. In the times of the Viking raiders, Gravesend was one of the key points of defence and from then on it was always kept fortified. In the Middle Ages many brilliant ceremonies and pageants were to be seen there when important personages arrived from abroad. Nowadays the pomp and pageantry are gone. But Gravesend is still the gateway of London. In this chapter, Frank Bowen gives a full account of Gravesend. EMBARKING AT SOUTHAMPTON in the transport Neuralia for Malta and Aden in September 1935. Royal Marines in helmets and khaki service dress uniform are seen in this photograph. The Neuralia, a British India twin-screw vessel of 9,182 tons gross, was built in 1912. THE THREE FUNNELS of the Monarch of Bermuda, the Furness-Withy luxury liner, are black, with one narrow and one wide band of deep red. 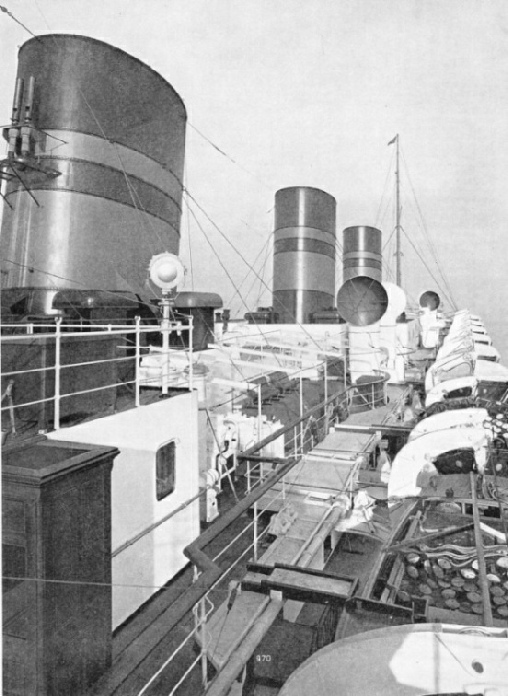 This unusual photograph gives a striking impression of the liner’s boat deck and superstructure. Four electric motors developing 20,000 shaft horse-power drive the Monarch of Bermuda and her sister ship at about 19 knots. LAST MOMENTS OF THE SINKING BATTLESHIP. 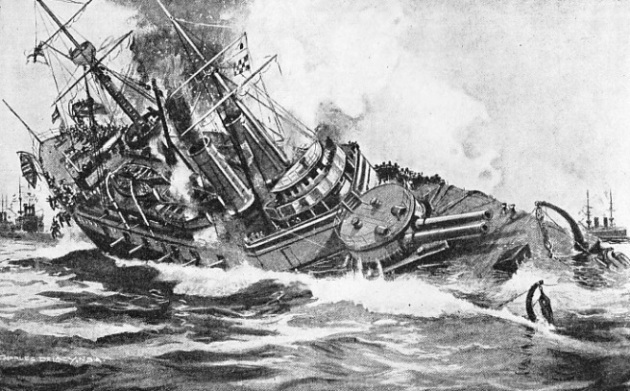 An impression of HMS Victoria a short time before she went down by the head, causing great loss of life. 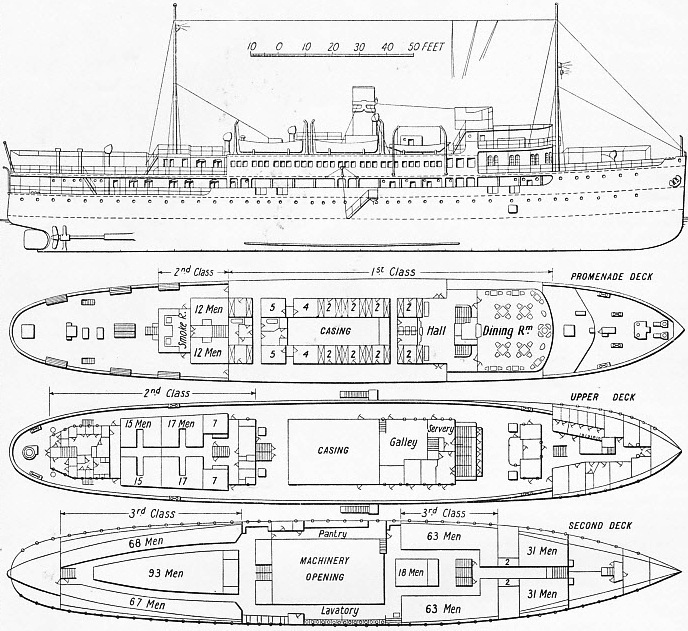 The forward turret of the Victoria carried two guns, each of which weighed 110 tons. The Benbow, the Sans Pareil and the Victoria were the only ships of the Royal Navy to be fitted with this type of gun. Formerly the fighting in warships was done by soldiers specially embarked for that purpose. The modern Royal Marine Corps is one of the most striking links with those days of early maritime warfare. This chapter is by Frank Bowen and is the fourth article in the series Going to Sea. 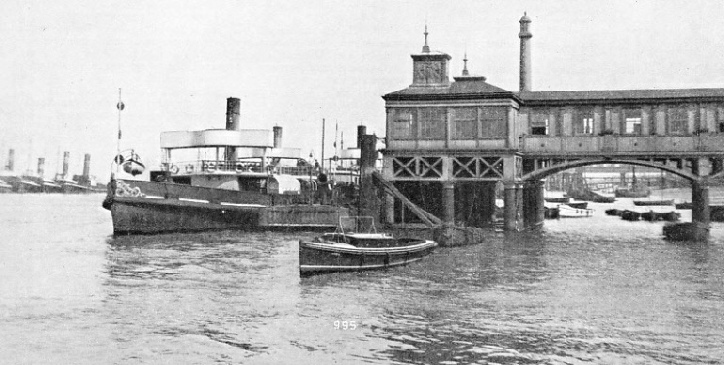 TILBURY-GRAVESEND passenger and vehicular ferries are operated by the London Midland and Scottish Railway. Alongside the Town Pier is the Edith, a twin-screw vessel of 285 tons gross, built in 1911. She is 131 ft 7 in long, with a beam of 28 ft 6 in, and a depth of 8 ft 5 in. In the background, on the left of the photograph, are a number of tugs moored to the Town Buoy. The first man to sail on a single-handed voyage of World circumnavigation since Captain Joshua Slocum’s exploit in 1895-98. Harry Pidgeon left Los Angeles in the Islander on November 18, 1921. His voyage lasted for nearly four years. This chapter is by Sidney Howard and is the sixth article in the series Great Voyages in Little Ships. The article is concluded in part 32. 1,250 lb. The yawl proved a splendid sea boat. A FINE MODEL of the Golden Hind in Plymouth Harbour in 1936. Originally known as the Pelican, Drake’s famous ship had three masts and a long beak bow. Accurate dimensions are not known, but she was a vessel of about 100 tons, with a length of about 60 feet and a beam of 19 feet. Her normal draught was about 9 feet, or 13 feet when fully laden. She carried eighteen guns and had a complement of over eighty. The Monarch of Bermuda and the Queen of Bermuda are two large British liners that run regularly between New York and Bermuda. This special service has definite characteristics which govern the design of luxury liners for the run. Bermuda has long been a popular holiday resort among Americans, particularly in the days of Prohibition. To deal with this holiday traffic, the Furness-Withy Line built first the Bermuda, later destroyed by fire, then two all-electric ships, the Monarch of Bermuda and a sister ship, the Queen of Bermuda. This chapter is by A C Hardy and describes the accommodation of the two vessels, and gives full details of the engineering and mechanical aspects of the ships. This the eighth article in the series on The World’s Largest Ships. ALL-ELECTRIC FROM STEM TO STERN. The Monarch of Bermuda, the Furness Withy liner, of 22,424 tons gross, and her sister, the Queen of Bermuda, 22,575 tons gross, are luxury vessels, capable of cruising in comfort round the world. They are employed on the service between New York and Bermuda, which has long been a holiday resort favoured by Americans. The ships were built at Newcastle-on-Tyne and Barrow-in-Furness respectively. The Monarch of Bermuda has a length of 553 ft 2 in, a beam of 76 ft 7 in and a depth of 39 feet. Her sister ship has almost the same dimensions.